This week I am up and around again after my surgery. I'm not feeling 100% yet, but every day is a bit better than the day before. 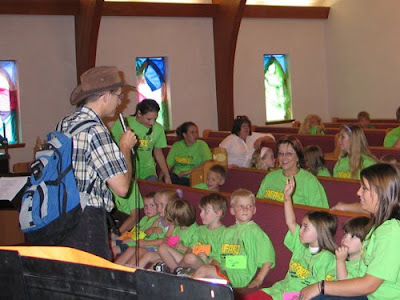 This week we have been asked to give two missionary presentations at Hoodsport church Vacation Bible School. The theme was safari, so I dressed in my hiking clothes and am telling the kids about hiking through the jungle to teach our Isnag friends about the Bible. Between those two presentations we made a quick trip to Spokane to see the Sullivan family. Russ and Nancy were classmates with us back in mission training days. They went Thailand and we went to the Philippines so we don't see each other often; ten years in fact. They only had a short time in Spokane before departing for Manitoba, Canada, so we jumped in the car and went to see them. We really enjoyed our visit with them and we ran into the Eyestone family from Manila while were were there too. Spokane has a beautiful waterfront park with all kinds of flowers, bridges, waterfalls etc. 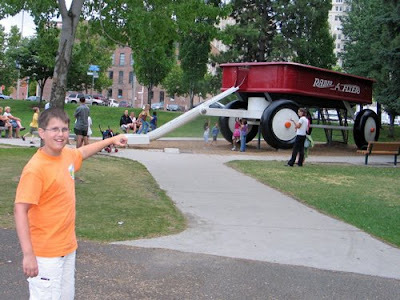 The thing that really surprised us was the giant wagon.